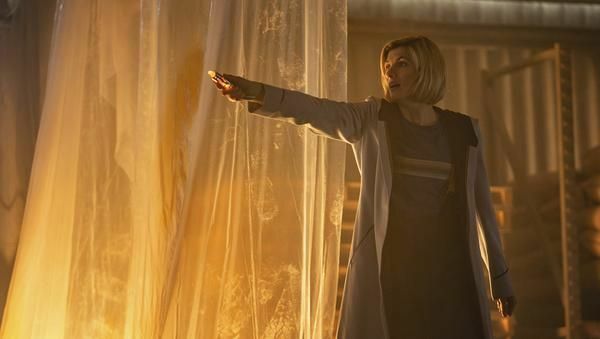 Jodie Whittaker as the Doctor in Doctor Who. Ryan (Tosin Cole), Yasmin (Mandip Gill) and Graham (Bradley Walsh) as the companions. Airs Tuesday, January 1st from 8 pm – 9:30 pm ET As the New Year begins, a terrifying evil is stirring from across the centuries of Earth’s history. Will the Doctor, Ryan (Tosin Cole), Graham (Bradley Walsh) and Yaz (Mandip Gill) be able to overcome this threat to Planet Earth? The all-new episode is written by Chris Chibnall and directed by Wayne Yip (Preacher, Dirk Gently’s Holistic Detective Agency). Comments: A being of great evil is buried at three different sites and watched over by custodians. Celebrating New Years with the Dr. is marvelous. The evil has escaped so of course, the Dr. shows up. It sounds a lot like a being from the Dr.’s past. The voice makes it obvious it is evil. This episode does handle this creature differently then it has ever been done before. The Earth is in deadly peril. In with the planet threat, there is drama. A love interest, relatives getting closer and finding out changes that have occurred on Earth since last the Doctor was there and in need. The Dr. pisses off the menace. It has one objective to conquer Earth. Only the Dr. stands in its way. The Dr. has a plan and it does not work out fully as planned. It does work out though. It is a nice touch having the Dr. introduce her traveling companions not as companions but as her best friends. This Dr. has more humanity than other versions and it works well with the way this actress portrays the Dr.